Two plants stole the show last weekend when my garden was open as a fundraiser for the Barnstable Education Foundation. Their habit is completely different, but they were the most asked-about varieties. Lespedeza thunbergii ‘Gibraltar’ is a perennial that looks like a shrub. If you plant this, be sure to allow at least eight feet in diameter for it to sprawl…no skimping. Although Lespedeza dies to the ground every winter it grows to four or five feet tall and eight feet wide every summer. 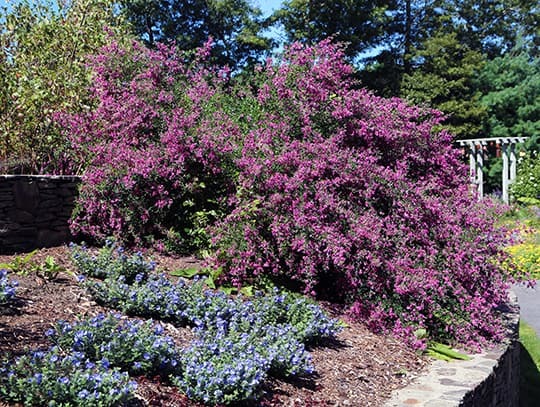 The plant has attractive foliage all summer but when it explodes with purple flowers in September it’s stop-in-your-tracks-spectacular and worth every inch of the space occupied. Next to the Lespedeza I planted Evolvulus Blue My Mind, an annual from Proven Winners. The flowers on this Evolvulus are blue, blue, BLUE. True blue, sky blue, yes, blue my mind blue. It is as neat, tidy and small as the Lespedeza is big, bold and floppy. I liked the contrast in habit as well as the combination of colors. This Evolvulus likes heat and didn’t take off in my garden until the hot, dry weather that hit us in July. Strangely, however, once this annual was off and running it tolerated the cool August nights just fine and is actually one of the plants that shows off its flowers even better on rainy days. I should have put a sign on these two plants so that people wouldn’t have had to ask their names…but I’m fairly stubborn about not including plant labels in my garden. I want to enjoy how the plants work together without the distraction of signs. Our eyes and attention are drawn to the printed word (why do you think so many companies put their name on tee shirts and the like?) and when a plant is labeled I think our focus goes to the name not to experiencing the full and total wonder of what is in front of us. And yet I know that many of those who walked through my gardens stopped by these two plants and thought, “What are these?” and then, “I want them!” So add them to your shopping list for next spring…see tips for success in the “Sharing the Wealth” section after the photo. Whether you label them or not is up to you. Enjoy. On the next rainy day (soon, please!) I'll post a photo of Blue My Mind because it will blow yours. Stunning plants for the garden, one a small annual and one a large perennial. Be willing to wait for Evolvulus Blue My Mind to appear at your local garden center. If it’s a cold, wet spring this plant won’t take off for the growers well so it might be later in June before you can find this annual. It’s worth the wait. Plant Blue My Mind with a combination of a synthetic time-release fertilizer and an organic such as Flower-Tone. I use equal parts of each and scatter it over the entire area where I’m planting annuals. I do not use this same mix for perennials, however. Annuals need extra fertilization but perennials don’t usually need so much extra nutrients. Be sure to place both of these plants where they will get at least 6 hours of dead-on sun. Don’t skimp on the space where you plant a Lespedeza. Be realistic. Can the plant get eight feet wide without crowding? Really?